Answer: Indeed there is, even though nobody has ever seen or imaged one directly. I get this question a lot, and answered it way back in September 2005. It’s about time to “upgrade” that answer, since there’s a special effect in my new graphics app that lets me simulate a feature of black holes that I couldn’t do before. First, I need to talk about the “state of black holes” in current astronomical theory. Joseph-Louis Lagrange (1736-1813) first suggested the idea of an object with gravity strong enough to prevent even light from escaping. Their existence was proved possible as a solution to Einstein’s gravitational field equations in 1916 by Karl Schwarzchild. The term “black hole” was coined by physicist John Wheeler in 1967. Although hotly debated at first, scientists in the 21st century are near-unanimous in accepting the reality of black holes. This, despite the fact that astronomers have yet to see one. But the indirect evidence is substantial, and physicists are hard-pressed to explain what could stop a black hole from forming once a sufficiently massive star begins to collapse. Note that I described the consensus as “near unanimous.” The dissenting faction believes quantum effects will prevent the formation of a black hole. But to date, nobody has devised a quantum model that accounts for the indirect evidence. The gravitational model predicts that a star with a mass 5-10 times that of our Sun (estimates vary) can form a black hole. When that star reaches the end of its life, and begins to collapse for lack of fuel, the core will be crushed beyond the point of no return. At some small finite radius, the force of gravity will overwhelm even the strongest forces of nuclear repulsion. The core will be crushed into what is called a singularity. The term singularity actually comes to us from mathematics, where it’s used to describe a situation where an expression produces infinite values (like when you attempt to divide by zero). Since the singularity has a radius of zero (it’s a dimensionless point), equations for calculating density, temperature, and gravitational field strength all yield infinite results. And physicists don’t like infinite results — it’s usually a clue that there’s something wrong with the equations. Of course, Nature is just doing what it always does, indifferent to our lack of understanding. That’s as far as we need to go into the theory to answer your question. 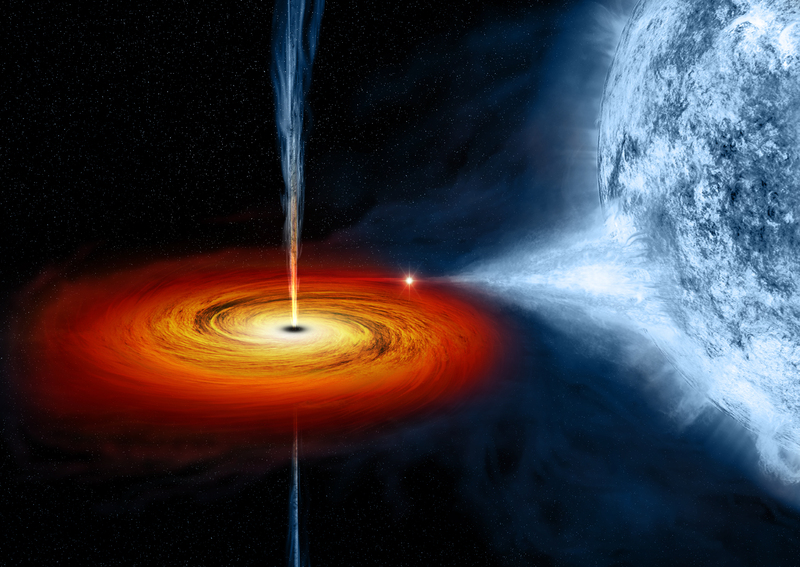 The artists who draw or animate black holes generally consult with scientists. Not so much in Hollywood, since they’re more concerned with dazzling special effects. But when you see a simulated image of a black hole in a reputable scientific publication, you can be sure it reflects the current scientific consensus. When you look directly at a black hole, from any direction, it will appear as a black disc within which no stars can be seen. The circular border (gray line) of that black, featureless area is called the event horizon. 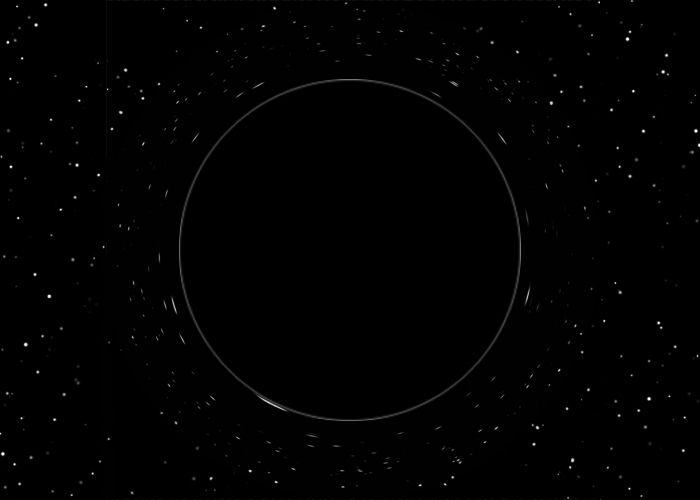 The event horizon itself should be visible as a glowing ring around the black interior. With perfect symmetry, a photon could “orbit” a black hole continuously at the event horizon. In the real world, photons would be constantly exiting the event horizon near-tangentially, or falling in. Stars near the line of sight toward the event horizon would be gravitationally distorted, and smeared out into arcs of light. Stars behind the black hole could be gravitationally lensed into multiple images of themselves. We are getting very close to actually imaging the super-massive black hole at the center of our Milky Way Galaxy. Within 10 years, the Event Horizon Telescope (EHT) should be online, delivering our first images of that enigmatic object. Known as “Sagittarius A*,” this black hole is thought to have 4 million times the mass of the Sun. Will it look like the graphic I created? Not really. The image will be constructed from radio waves, and false-colored to highlight details, but it should show the principle features I illustrated. My graphic shows what your eyes would see from a safe distance. Further, although Sag A* is “close” to naked, it will likely be surrounded by a small accretion disc with minimal perpendicular plasma jets, as shown in this (reputable) image.